The University of Alabama has one of the three richest athletic departments in college sports thanks in large part to its football program. Yesterday we took a look at how the football team spends its riches. But that money has to come from somewhere and the chart below breaks it down. Of the athletic department’s $US143.8 million in revenue, $US88.7 million comes from the football program according to data obtained by BusinessOfCollegeSports.com. The biggest chunk of the pie comes directly from ticket sales. However, donations may be underrepresented. 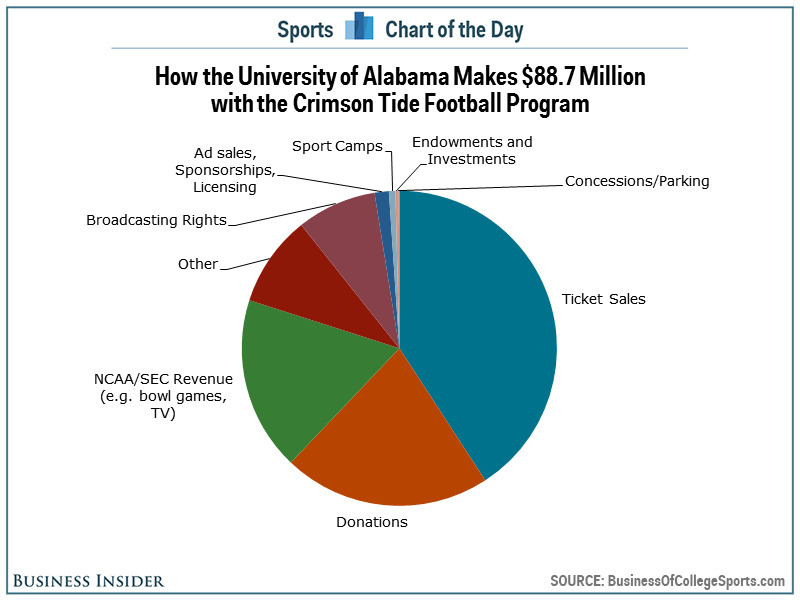 According to data obtained by USA Today, the Alabama athletic department received $US34.2 million in donations in 2013, and yet, only $US18.9 million was specifically earmarked for the football program when in reality the football team’s three championships in five years probably had a strong influence over most of the donations.